ABS is an automobile (bike) safety system that allows the wheels on a bike to maintain tractive contact with the road surface according to driver inputs while braking, preventing the wheels from locking up (ceasing rotation) and avoiding uncontrolled skidding. and you'll be able to steer while you stop. The first rule of braking with ABS: brake as though you did not have ABS. Pull the brake lever quickly, but not abruptly. Once the brake pads have fully engaged, increase the braking pressure quickly, and in significant amounts. When performing a full braking maneuver, brake on straight course within the ABS control range. Depending on the model, you can tell that the ABS has kicked in through a gentle pulsing on the hand and foot brake levers, as well as a tacking noise. When performing a full braking maneuver, always disengage the clutch at the same time. When braking in bends, increase the braking pressure gently to prevent the front wheel from slipping to the side. Always pay attention to the rear of the motorcycle when performing a full braking maneuver. If the rear wheel lifts up, you should reduce the braking pressure on the front wheel as quickly as possible. odern ABS systems can support the driver in this regard. Skidding of a vehicle leads to disaster in many cases. Skidding starts when force applied by driver on the brake lever is more than the required. Skidding results when friction in brakes become more than the friction exists between tyre and road surface. That means wheel gets locked and start skidding on road surface. Less force leads to poor braking and more force leads to skidding. So to avoid the skidding of vehicle, the braking force should remain in limit. In normal bikes, the brake lever is directly connected with calliper. The force applied by the driver on lever is directly exerted on calliper & disc without any interrupt. In the case of ABS, this braking force is exerted through ECU and Hydraulic valve. The ABS prevents the wheels from locking during braking. It does this by constantly measuring the individual wheel speeds and comparing them with the wheel speeds predicted by the system. This speed measurement is done by individual speed sensors. If, during braking, the measured wheel speed deviates from the system‘s predicted wheel speed, the ABS controller takes over, correcting the brake force to keep the wheel at the optimum slip level and so achieving the highest possible deceleration rate. This is carried out separately for each wheel. Controller is nothing but an ECU with appropriate programming. This program avoids the rotational speed of wheel to become zero (Locking). This is done by temporary releasing the brake force by shutting off the valve in oil reservoir. The ECU constantly monitors the rotation speed of each wheel. When it detect that any number of wheel are rotating slower than the other (this condition will bring the tyre to lock), it moves the valves to decrease the pressure on the braking circuit, effectively reduce the braking force on that wheel. The wheels turn faster and when they turn too fast, the force is reapplied. This process is repeated continuously, and this is causes characteristic pulsing feel through the brake pedal. Donovan Green, United States, Department of Transportation had performed some experiments on bikes with and without ABS in 2006. Following bike were selected by him for his test. He had performed two types of tests: 1. Dry Surface Tests 2. Wet Surface Tests. Following are the results of his experiments. On the ABS-equipped motorcycles, the operator was tasked with braking sufficiently to assure the operation of the ABS. The measured stopping distance values were corrected to compare data from the speeds of 48 km/h and 128 km/h, except for the BMW F650 data, which was corrected to 48 km/h and 117 km/h, the latter figure limited by that model’s top speed of 157 km/h (i.e. 75% of 157 km/h). In the ABS-enabled mode, for each load/speed/brake combination, the stopping distances were very consistent from one run to another. In this mode, the braking force was applied in a controlled and consistent manner by the ABS mechanism. With the exception of having to react to the possibility of the rear wheel becoming airborne under high deceleration, the rider did not require significant experience or special skill in order to achieve a high level of performance. In the ABS-disabled mode, the stopping distances were less consistent because the rider while modulating the brake force, had to deal with many additional variables at the same time. Up to six runs were allowed for the rider to become familiar with the motorcycle’s behaviour and to obtain the best stopping distance. Test results from non-ABS motorcycles were noticeably more sensitive to rider performance variability. Despite being compared to the best stopping distances without ABS, the average results with ABS provided an overall reduction in stopping distance of 5%. The stopping distance reduction was more significant when the motorcycle was loaded (averaging 7%). The greatest stopping distance reduction (averaging 17%) was observed when only the rear foot pedal was applied to stop the motorcycle from 128 km/h. The original test procedure called for wet surface braking tests to be conducted at 48 and 128 km/h. However, for safety and stability reasons, all low-friction surface tests were performed in a straight-line maneuver, from an initial speed of 48 km/h. The tests were repeated with and without ABS. The test track was wetted by a water truck, and the wetting procedure was repeated every three stops. 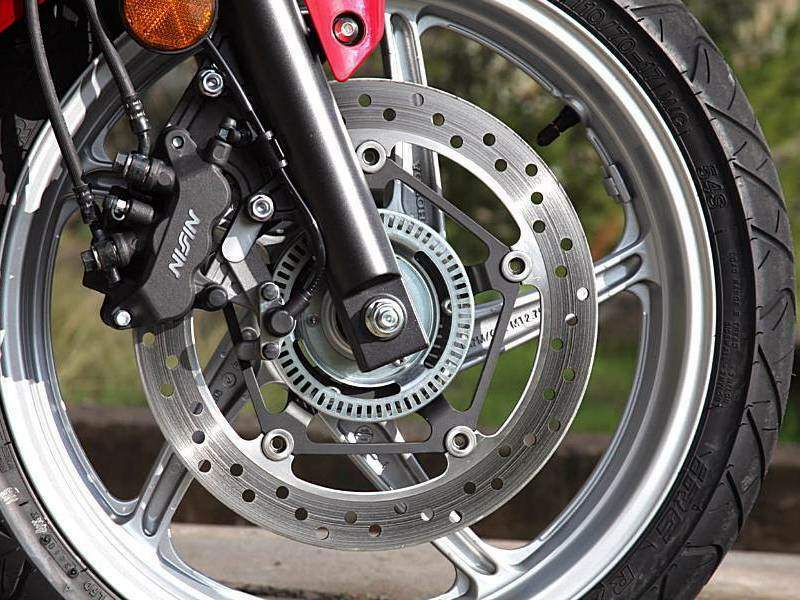 With ABS-equipped motorcycles, the rider was instructed to brake sufficiently to assure that the ABS was fully cycling by applying as much force as necessary to the brake control device (no restrictions on force application). The front and rear wheel brakes were operated simultaneously when the initial test speed was reached and then were operated individually when the front wheel and rear wheel were tested separately. During braking, the engine remained disconnected from the drive train. A steering operation was allowed to keep or correct the running direction of the motorcycle during the test. Below vehicle speeds of 10 km/h, wheel locking was permitted. For motorcycles not equipped with ABS, the test procedure was the same except that the rider was instructed to apply as much force as required on the brake control device in order to get the shortest stopping distance without losing vehicle control or having any wheel lockup above a speed of 10 km/h. As with the dry surface tests, practically no learning process was required for the operator to achieve the best performance with the operation of ABS. In the ABS-disabled mode, the stopping distances improved as the rider became more familiar and comfortable with the braking system. On the wet surface, the overall average stopping performance with ABS improved on the best non-ABS stopping distance by 5.0%. The stopping distance reduction with ABS was more significant when both brakes were applied, with an overall improvement averaging 10.8% over the best stops without ABS. The greatest stopping distance reduction with the use of ABS was observed when the motorcycle was loaded and both brakes were applied, averaging a 15.5% improvement over the best stops without ABS.